The shelter functions thanks to many volunteers. Volunteers work along our staff helping to care for our animals. Without the help of volunteers the shelter wouldn’t be able help over 1,000 homeless and unwanted pets each year. 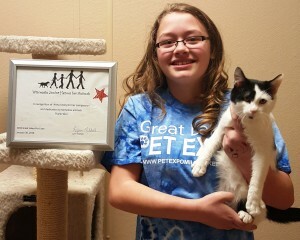 Anna J. was awarded the Wisconsin Junior Heroes Award through Badger Rescue Transport Service in January 2016 for her outstanding volunteer work at SWCHS! – Dog Care – cleaning indoor & outdoor kennels & organizing dog room. – Dog Interaction – walking, grooming & socializing dogs. – Cat Care – cleaning cages, grooming, socializing & organizing cat room. – Foster Care – provide a temporary home for an animal recovering from medical trauma, pregnant moms, moms & newborns, orphans, seniors or under-socialized pets. Learn more information about fostering. To become a foster, download the Foster Application. – Laundry & Cleaning – keep shelter tidy & maintain laundry area. – Groundskeeping – gardening, weeding & maintaining walking path. – Maintenance – basic repairs, painting & carpentry. – Pet Therapy – bring shelter pets to nursing & assisted living homes. – Pet Photography – take pictures of animals for ID cards & website. – Animal Transporter – drive shelter animals to off site locations. – Friends Group – helping plan fundraisers, volunteer at events and share information about South Wood County Humane Society with networks. – Obedience Training – teach shelter dogs commands & social skills. Please out the form below to become a SWCHS volunteer. Applications must be 16 years or older and provide a valid ID. Upon completion, our staff will review your application and contact you soon. We appreciate your support! In consideration of my participation in activities of the South Wood County Humane Society (SWCHS), I do agree to hold free from any and all liability the SWCHS and its officers, employees and members. I do release and forever discharge any rights and claims for damages or injuries, which I may hereafter incur, arising out of or connected with my participation in any activities or duties of the SWCHS. By submitting my application, I declare myself to be physically sound and medically able to participate in the activities of SWCHS.